Mixed vegetable pakora is my own recipe. Its a very easy and less time consuming recipe…..
-Sift besan and baking powder. -Slice all vegetables and put them in a mixing bowl. -Add all spices and sifted besan. -Add all spices and mix well all the dry ingredients with vegetables. -Gradually add water and mix with your hands. -Make a lump free mixture with vegetables. -Heat oil and add spoon full of batter in it. Keep them away from each other. -When they are brown, take them out on an absorbent paper and serve hot with tamarind sauce and mint coriander chutney. 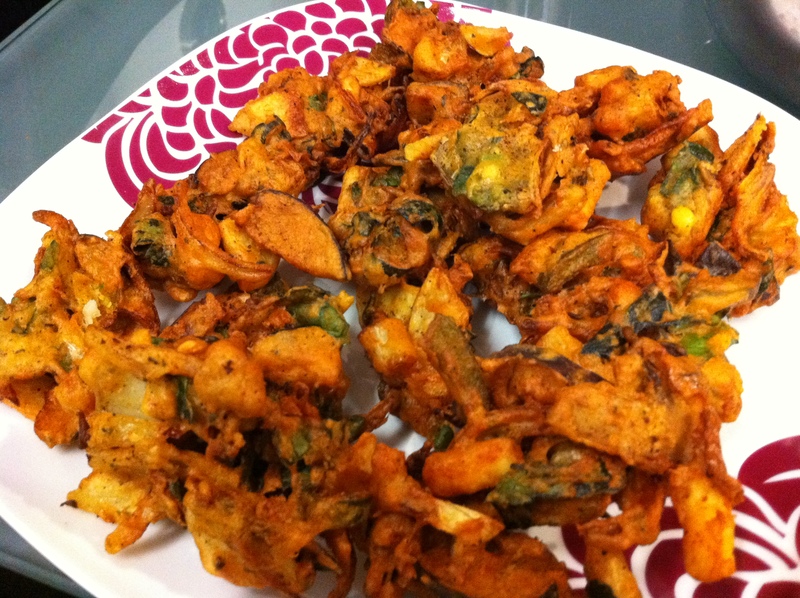 Tasty mixed vegetable pakoras are ready to serve.